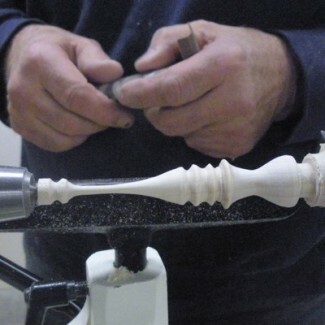 Woodturning offers a lifetime of possibilities. This craft is as useful to artists as it is to furniture makers. It’s a compelling craft full of as many challenges as it has rewards. A good start is to have a guide early on who can teach you the best ways to approach woodturning. What to avoid is as important as what works best. Your progress, satisfaction and indeed your safety can depend on it. Many who are self taught habitually repeat easily avoided mistakes. Lessons with an experienced woodturner can guide the novice turner through the thorny process of coaxing pleasant forms from common woods. Instructors Clint Stevens, Andy Kuby and Al Miotke are experienced woodturners and instructors who emphasize a hassle free, safe and encouraging learning atmosphere in their classes. These carefully designed classes are perfect for inexperienced turners. You will learn about the lathe, its accessories and the tools used to shape wood. Students will watch demonstrations, then apply what they have learned to independent work overseen and guided by the instructor. This 9-week session will span 10 weeks. In observance of the Holidays, there will be no classes on Memorial day, May 27, or July 3 and 4. Tools and Face shields are provided – This allows you to become familiar with the tools so you can make an educated choice when you decide to invest in your own tools.